Shankar Balasubramanian is a junior at Thomas Jefferson High School for Science & Technology. He has been playing violin since he was 5 years old. He is currently under the tutelage of Amy Beth Horman at the Horman Violin Studio in Washington DC. Shankar has received numerous awards at regional and state levels including the following: American Fine Arts Festival (AFAF) International Romantic Era Competition, AFAF International Concerto Competition ,Virginia State Concerto Competition, Gretchen Hood Memorial Competition , Washington Performing Arts Society (WPAS) Goldie Feder Memorial String Competition, Northern Virginia Music Teachers Association’s Concerto competition , Caurine Easterling String Scholarship competition, Maryland State Music Teachers Association, Rockville Competition for Piano and Strings (1st place). Shankar has performed at Carnegie Hall, WPAS Board of Directors’ Annual Meeting and WPAS Music in the Country program. He also performed as a soloist for Reston Community Orchestra. 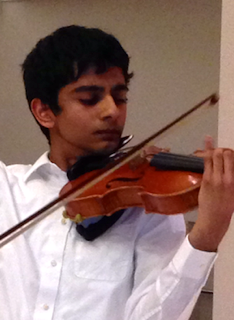 Shankar has recently been accepted into the Friday Morning Music Club (FMMC) in the category of solo violinist. Shankar’s solo appearances for the 2013-2014 season include a performance at the Alden Theatre in McLean VA as well as a live TV performance at the Fairfax County Board Meeting. He also performed in master classes with National Symphony Orchestra (NSO) Assistant Concertmaster, Ricardo Cyncynates, Baltimore Symphony Orchestra (BSO) Concertmaster, Jonathan Carney, violinist James Stern, and National Philharmonic Orchestra Emeritus, Jody Gatwood. Shankar was recently awarded 1st prize in the Feuer Memorial String Competition, sponsored by the Fairfax Symphony. He has the distinct privilege of having been selected as a Finalist in the Duquesne Young Artist National Concerto Competition and Army Orchestra Young Artists Competition. He also received an Honorable Mention as a Finalist in the MidAtlantic Regional Solo Competition. He was selected as a First place winner of Misbin Family Memorial Award by Washington Performing Arts Society.